Offred returns to fight another day. The second season of The Handmaid’s Tale TV show will premiere on Hulu in April of 2018. The dystopian drama is adaptation of Margaret Atwood 1985 novel. The Handmaid’s Tale, season one, debuted on Hulu on April 26, 2017, with new episodes premiering weekly on Wednesdays. An Outstanding Drama Series Emmy Award winner, The Handmaid’s Tale stars Elisabeth Moss, Joseph Fiennes, Yvonne Strahovski, Samira Wiley, Max Minghella, Madeline Brewer, Ann Dowd, O-T Fagbenle, Amanda Brugel, and Alexis Bledel. The Hulu TV show tells the story of life under the totalitarian regime governing Gilead. With the birthrate plummeting, the fundamentalist government treats fertile women as chattel. The first season ended with Offred (Moss) seemingly arrested and removed from the home where she served as a reproduction slave. Cast: Elisabeth Moss, Joseph Fiennes, Yvonne Strahovski, Samira Wiley, Alexis Bledel, Ann Dowd, Max Minghella, Madeline Brewer, O-T Fagbenle and Amanda Brugel. Crew: The Handmaid’s Tale comes to Hulu from MGM Television and is created, executive produced and written by Bruce Miller. Executive produced by Warren Littlefield, Elisabeth Moss, Daniel Wilson, Fran Sears, and Ilene Chaiken. MGM serves as the international distributor for the series. Synopsis: The Emmy-winning drama series returns with a second season shaped by Offred’s pregnancy and her ongoing fight to free her future child from the dystopian horrors of Gilead. “Gilead is within you” is a favorite saying of Aunt Lydia. In Season Two, Offred and all our characters will fight against – or succumb to – this dark truth. What do you think?. Have you read Atwood’s novel? 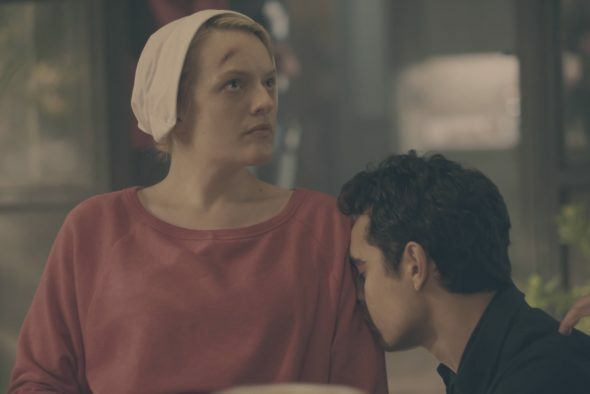 Did you watch the first season of The Handmaid’s Tale TV series? Do you plan to watch season two when it drops to Hulu? Let us know, below.